Partner with DADCO - for superior quality and unparalleled technical support. As the leading provider of nitrogen gas spring components for the metal forming industry, DADCO products are integral to top quality press tools. DADCO utilizes high quality resources and technologically advanced equipment to design, develop and manufacture complete lines of nitrogen gas springs, nitrogen gas spring lifters, ISO air cylinders and hydraulic core pin cylinders. Search our Online Catalog for products. 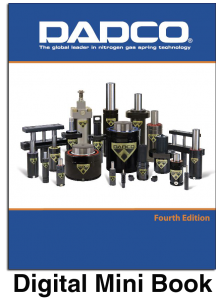 DADCO offers our popular miniature product catalog in both a digital version for use on your computer or as an App for use on your mobile devices.